Home > About us > Success stories > An inspiration by the film industry to an award winning inspection tool- the CU24 by Applus+ RVIS. 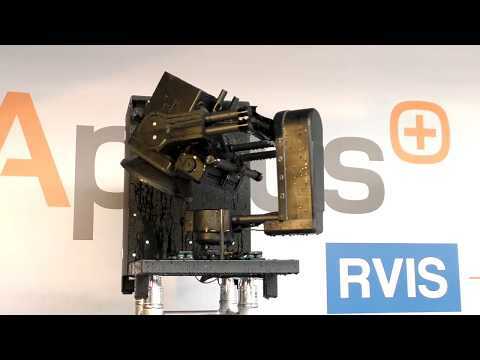 An inspiration by the film industry to an award winning inspection tool- the CU24 by Applus+ RVIS. s of 24m and below, up to -2m. It replaces people working at dangerousheights while it is 10X faster and a great money saver on pipe-racksinspection. For that reason last April it won the commercial award at ShellPernis. The CU24 is a stabilised crane, a flight head or a camera crane. More concisely described, it is an HD camera mounted on a telescopic crane that can inspect at heights of 24m and below, up to -2m. It replaces people working at dangerous heights while it is 10X faster and a great money saver on pipe-racks inspection. For that reason last April it won the commercial award at Shell Pernis. In 2015 Dennis Van Iersel, Program Manager at Shell Pernis, was looking for remote solutions to inspect pipe racks. His goal was to reduce downtime in maintenance turnarounds and one of his means was to speed up pipe racks inspection. Dennis thought of drones first as they usually implicate little or no downtime. He invited Bas Pauw, Managing Director of Applus+ RVIS and an expert in drone technologies, to discuss the possibility of using drones. At the time Bas was directing Airfilms, a drone company servicing both Oil & Gas and the Film industry. To the surprise of Dennis, Bas did not encourage the use of drones. He rather suggested to customise a stabilised crane mounted with an HD camera specifically for pipe-racks inspection. In fact Bas was inspired by the Russian Arm, a tool widely used in film making to capture moving scenes. While drones are limited by exhaustive rules and regulations, cranes are often used on industrial sites. People at Shell welcomed the innovative idea while the technical team went on with developing the new tool. During testing and after proof of concept, the crane was made telescopic to reach different heights of pipe-racks up to 24m (CU24 -SeeYou at 24 meters). Its flight head was also adapted to be rain resistant. Therefore its camera can produce high quality imagery in rainy weather to suit the climate in the Netherlands and Northern Europe. The CU24 has been able to successfully detect coating failure, corrosion, fire-proofing, loss of containment, pitting and wall losses on pipe-racks, trenches and their supporting structures. According to inspector Rob Van Son who has been working on the CU24 for more than a year now, inspecting pipes hasn’t been easier. He is able to see more things in more detail and without the pressure of being on a rope. The flexible camera gimbal allows all angle view while the 50X optical zoom permits magnification of tiny details. And most importantly he can inspect dangerous heights remotely while sitting in RVIS mobile centre looking at a screen with absolutely no risk whatsoever to his health and life. In mid August last year Applus was awarded the contract to inspect pipe-racks and their supporting structures at Pernis. That is when Applus+ RVIS, a joint venture of Applus+ RTD and Airfilms emerged. Sytze Voulon, Executive Vice President of Applus+ RTD Northern Europe, who led the establishment of the new JV, believes that Applus+ RVIS is deemed a great success. It is a mix of the leading experience of Applus in inspections with technical capabilities and entrepreneurial spirit of Airfilms’ team. RVIS’ mission is to revolutionise visual inspection and non-destructive testing through automation. Inspections will be safer and cheaper and will empower preventive maintenance with valuable data.Undoubtedly the CU24 gained great respect at Pernis where it won the commercial success award in April 2017. From Pernis, it went to Moerdijk where they inspect pipe-racks by blocks. Peter Tielman, senior inspection support engineer, regarded the CU24 as a great tool for a risk based approach maintenance of pipes. It is ideal to quickly scan the condition of pipe racks, pipelines and trenches. These structures usually undergo time-based inspection that required closing the roads and passages and exhausting scaffolding. By using the CU24 Peter’s team carry out a quick assessment and establish priorities for detailed inspection. This allows Hans Spijkerman, Head of Inspections, and Henk Riepema, Inspection Manager, to set the longterm strategy for pipe racks and trenches maintenance according to condition and risk. Thus the CU24 empowered their maintenance program with careful planning and maximum use of resources. Applus+ RVIS’ ambition is to eliminate the need for people to work in dangerous situations and to reduce the number of accidents by automating inspections. One of the major causes of accidents and unplanned downtime is delayed maintenance turnarounds. Regularly scheduled maintenance is usually postponed to avoid shutdowns, keeping up the production. The main reason is that maintenance is ineffective and requires long downtimes. “In order to effectively do maintenance, we have to innovate”, says Daan Hartge, Technical Team Lead of Applus+ RVIS. We need to work together with artificial intelligence. We can develop remote tools to replace humans where dangerous or repetitive work is required while avoiding unnecessary shutdowns. With today’s technology it is possible to send drones or ground robots to inspect assets in production such as flare stacks or tanks. We are able to keep robots at a safe distance while we take detailed imagery. We use live video feedings or we store the data in the cloud. This information allows us to plan maintenance based on priorities one step at a time and without compromising production. Applus+ RVIS team offers remote solutions for inspections in Oil & Gas, Construction, Utilities, and the Food Industry. They adapt tools in-house to inspect structures like flare stacks, storage tanks, boilers, phase separators, power lines and power towers, pipelines and pipe-racks. They often tailor solutions based on clients ’needs. Currently the CU24 is getting ready to carry its first IR camera for thermal imagery of the pipes, and maybe for another award?